The Long Expected Party dance came and went in a flurry of beautiful music, tired feet, lots of laughter, and many beautiful costumes. And now I can finally reveal Laura's outfit and the jewelry I designed for her! Laura (of Sew Many Seams-- check out her blog!) created the world's most intricate costume and dressed as an Entwife. You can see more details of her handmade corset and cloak in this photoshoot. click to enlarge and see the costume in its full glory! 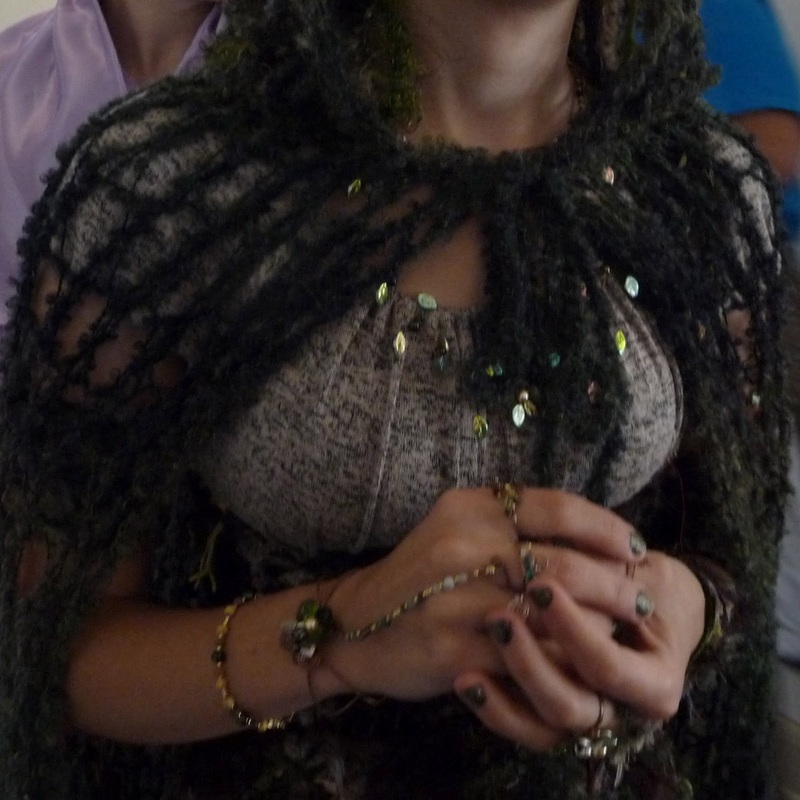 Just look at her insanely awesome green yarn dreadlocks! 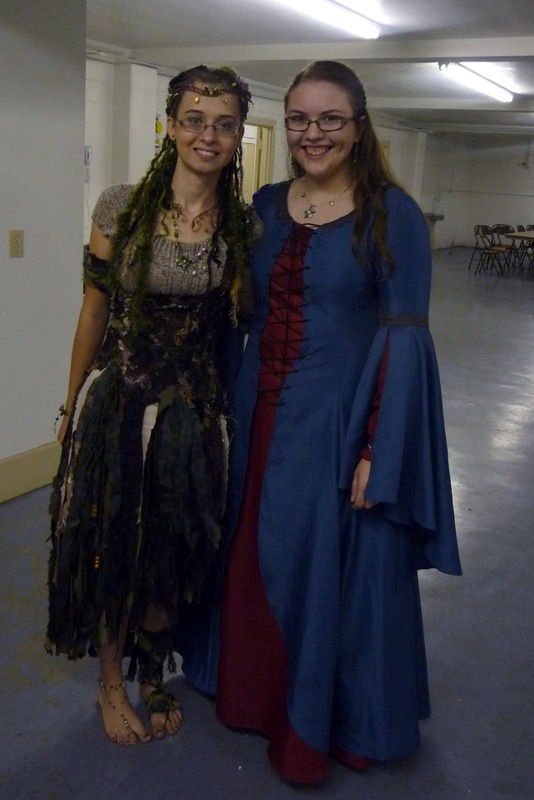 A shot of Laura, and me in the dress that she made for me! Isn't it gorgeous? 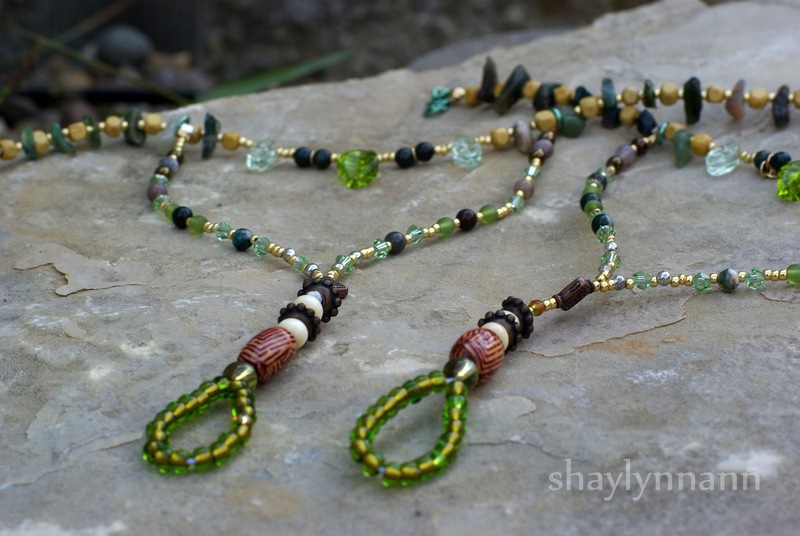 I haven't had so much fun creating jewelry in a long while! Normally I can't justify my time and the cost of materials to work on intricate new designs, but when I do custom work I have a very good excuse. :) Laura had a few very specific ideas but left most of the designing completely up to me. For those of you who are wondering how I go about drawing jewelry, I normally don't unless it's for custom orders or insanely complex. 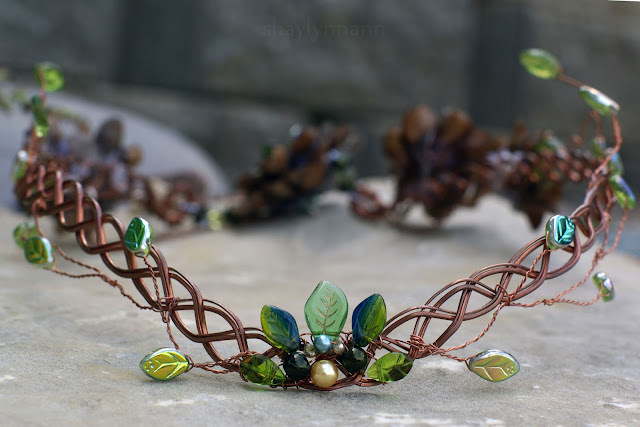 This project was both-- and the circlet in particular. I pictured it in my head for several days, mulling over ideas and lines and shapes and colors. I knew it was going to be a braided base, so that was the first thing that I drew. (Now that I have an intuitive feel for basic Celtic knotwork, drawing braids is super easy!) Then I added the details, changing a few things here and there when it looked funny on paper. The finished drawing-- and the finished product-- wound up being remarkably similar to what I pictured in my head. 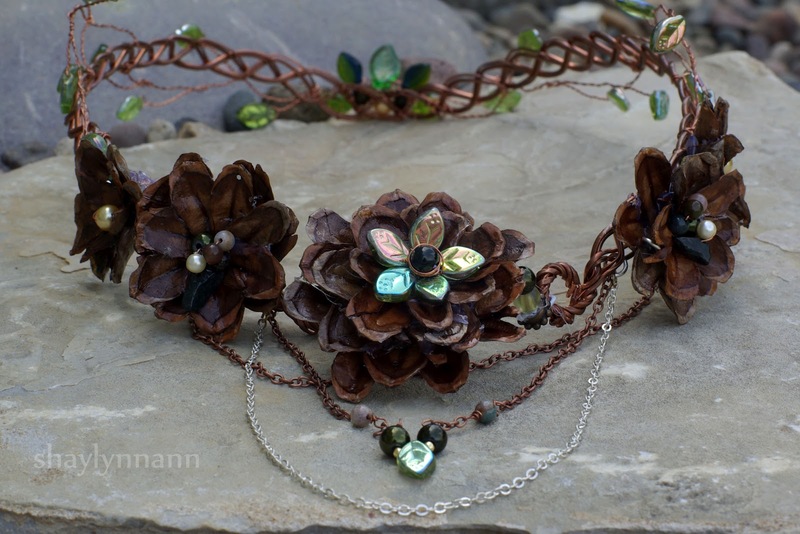 On the bottom you can see the specifications she had-- tree-like, braided copper circlet with leaves and pinecone flowers. Both Laura created Pinterest boards (here) with inspiration-- this was very helpful because she had so many wonderful and detailed ideas that I had a hard time understanding in writing. I'm rather proud of these new designs and wanted to get good photos to show them off! I am always more than happy to make custom jewelry and I can create similar pieces to the ones shown below. Everything but the circlet would be in the $10 to $30 range. M: You got it! Give me five minutes to change and I'll be right over! (See what I mean about how awesome she was about this? 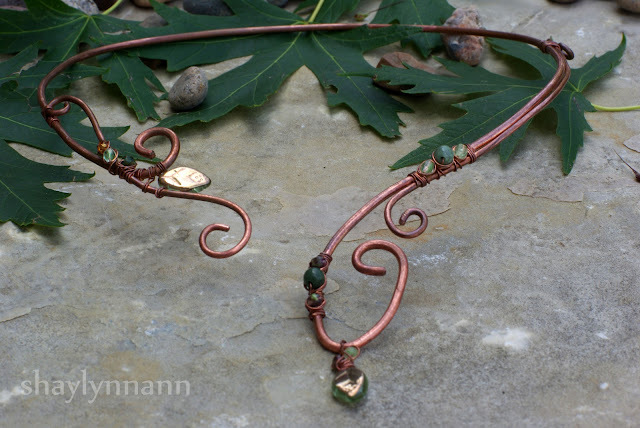 This circlet is made from thick braided copper wire. I nearly killed my fingers making it-- I forgot to order dead soft wire and instead got half hard, which is not easy to bend when you are wrangling six three-foot strands around a vise! 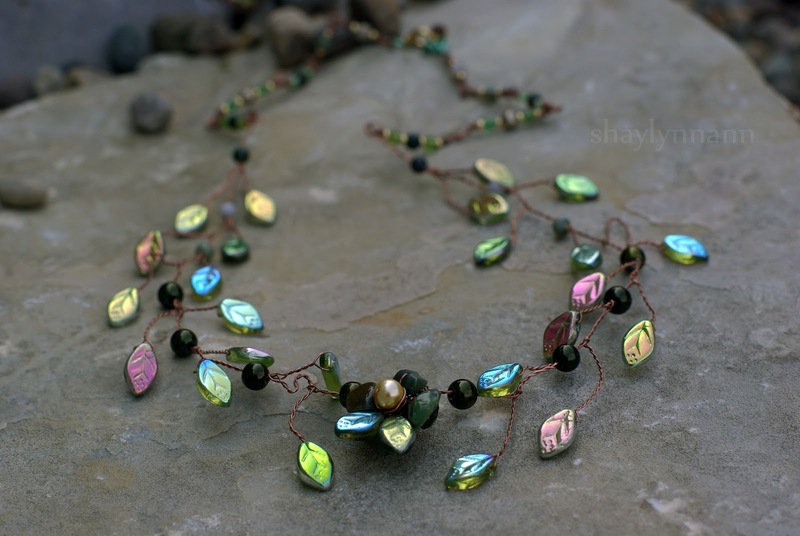 There are around twenty five or so Czech glass leaf beads in sundry shades of green and iridescent periodot. 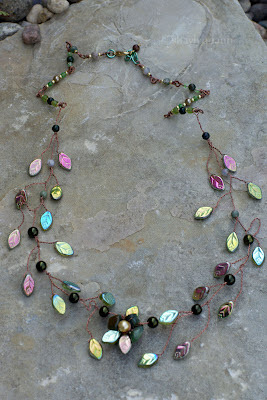 I also used a few Swavroski pearls. 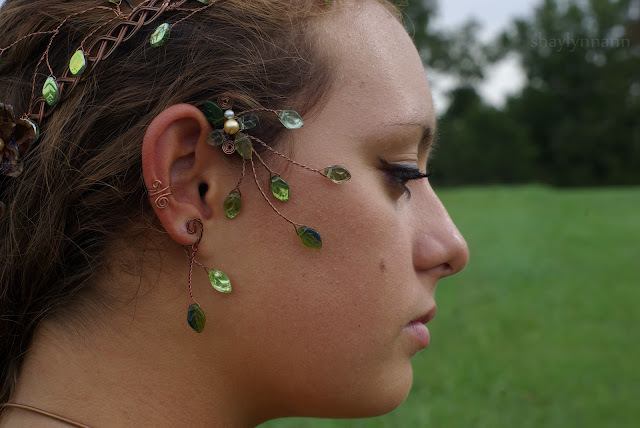 You can't tell from these pictures, but the structure of the circlet's back is very complicated. 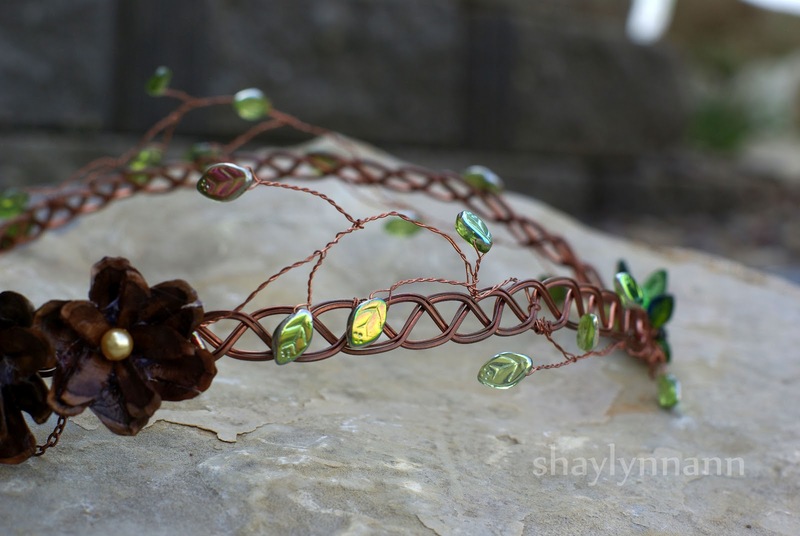 Laura made yarn dreadlocks for her costume, so I used elastic cording to attach the biggest pinecone centerpiece to the edges of the circlet in the hopes that it would stretch to the right size. (It did!). There are also several strands of chain dangling in the back. 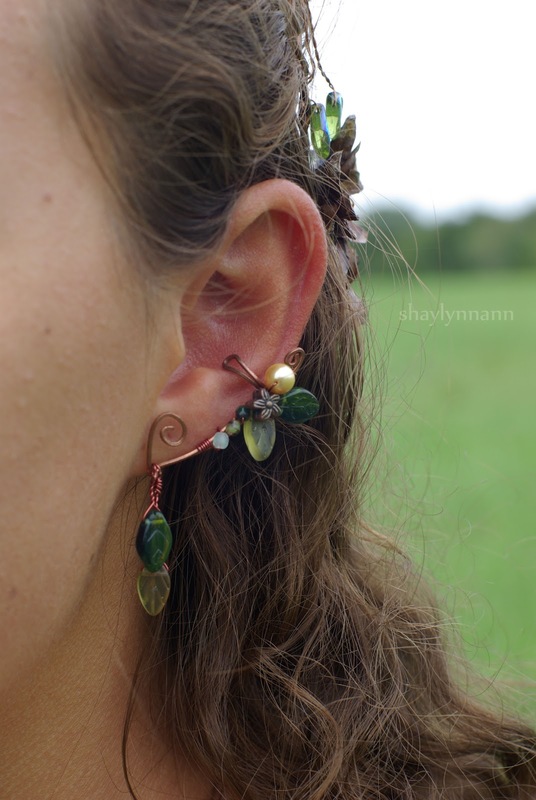 The center one has some beading in there. 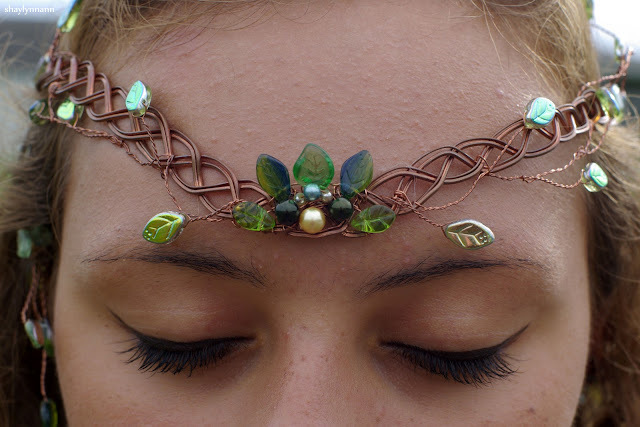 I ran out of thin raw copper partially through this project (just look at how much wire is needed for this little bit of the circlet! ), so I'd like to send a shout-out to UnkamenGifts for mailing me more last minute. 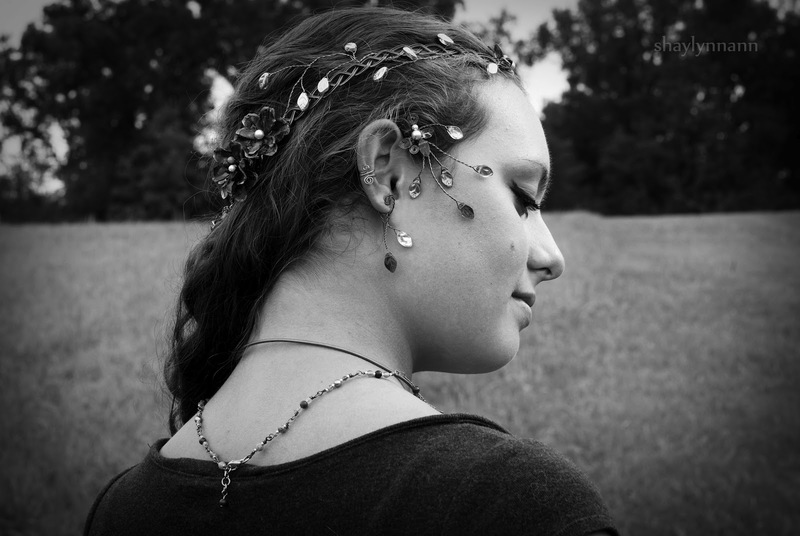 The circlet, modeled by my beautiful friend. Since M. clearly does not have on thick faux dreadlocks, the circlet hangs low on her head. 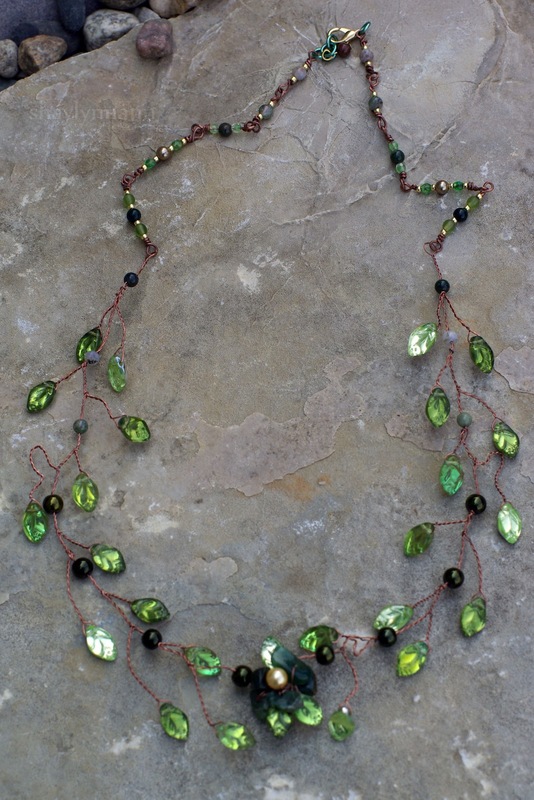 This is a torc necklace, also made of raw copper and glass beads. Someday I want to learn to solder and to get a torch for melting copper (our propane one is too weak)... I think that this turned out very well and extremely sturdy with wirewrapping, but it would be neat to experiment. 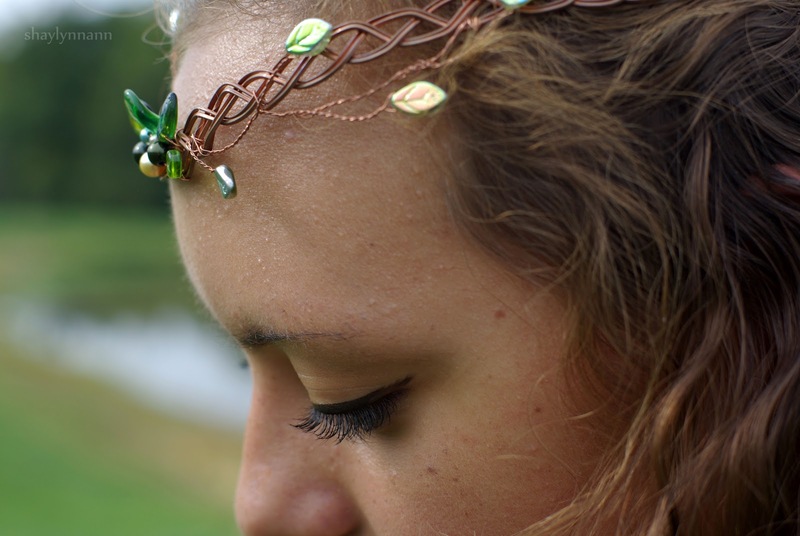 A torc, also spelled torq or torque, is a large, usually rigid, neck ring [pennannular, forming almost a complete ring with a hole in it] typically made from strands of metal twisted together. The great majority are open-ended at the front, although many seem designed for near-permanent wear and would have been difficult to remove. [...] The Celtic torc disappears in the Migration Period, but during the Viking Age, torc-style metal necklaces came back into fashion. The bottom bead is removable, since I wasn't sure how low Laura wanted the necklace to hang on her neck. An upper-arm cuff with thick raw copper hammered to be sturdy. It's adjustable, and quite small because Laura is very slender. 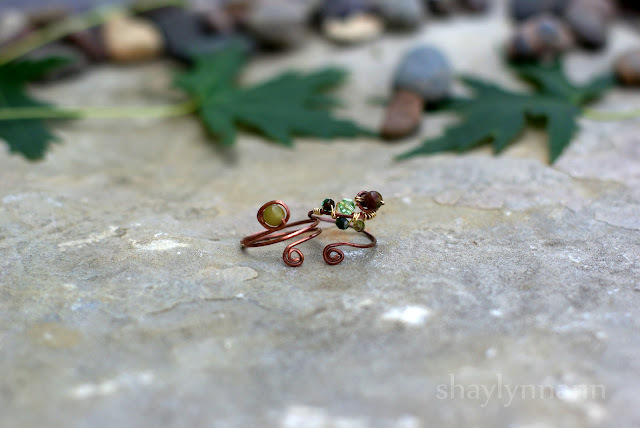 A couple of adjustable rings. Rings for nearly every finger! 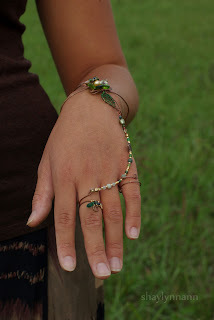 The beading is attached with a removable hook, so the cuff can be worn on its own. 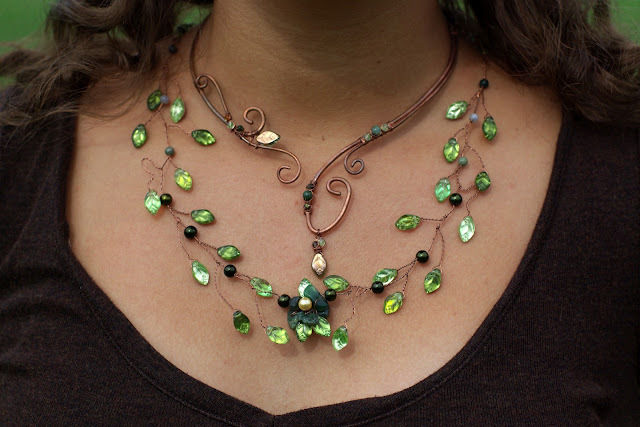 This vine-like necklace was so fun. It's made with reversible beads and a ton of wire! 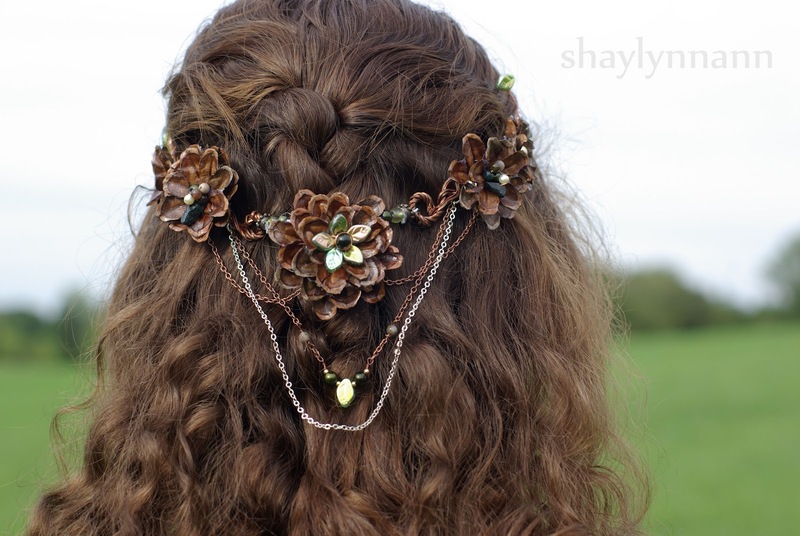 The entire back just has strings of wirewrapped beading-- it was designed to go with the choker-length torc necklace and having leaves around the back of the neck would overwhelm it. 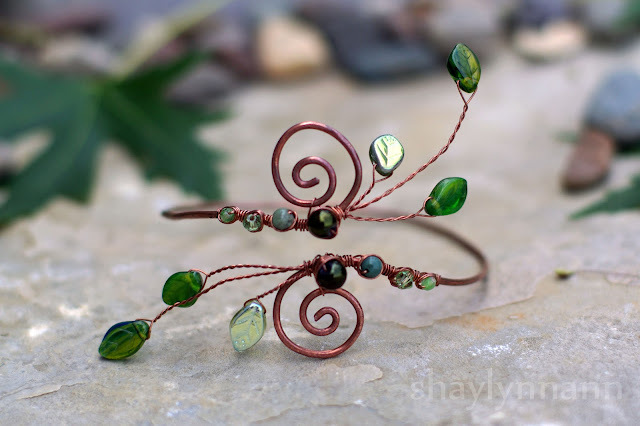 I like this technique and plan on experimenting with it for bracelets and more! 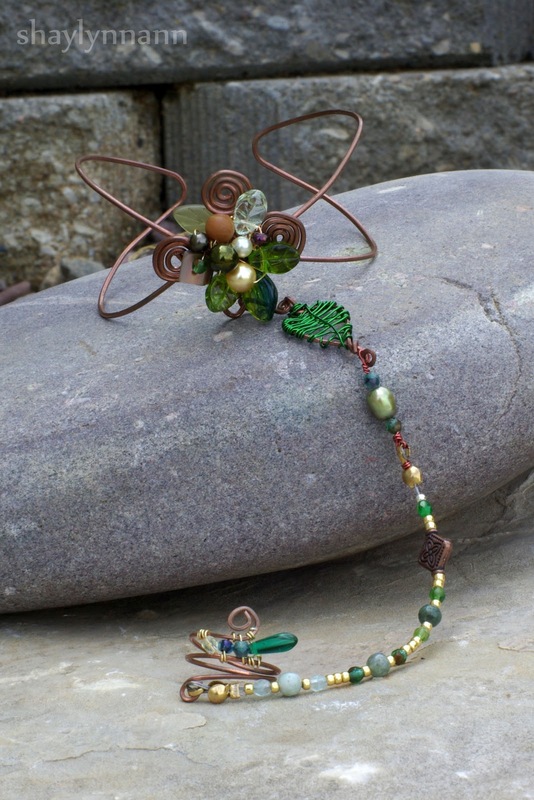 Fairy sandals, also known as foot thongs or barefoot sandals! These are so fun, but it was hard to size things properly so that the ankle width and length were right. I used a bit of elastic cord on the toe, but I tend to avoid that stuff as much as I can and the rest is beading wire and jump rings! I've got it all figured out now, and look forward to having the time to sit down and make some more. 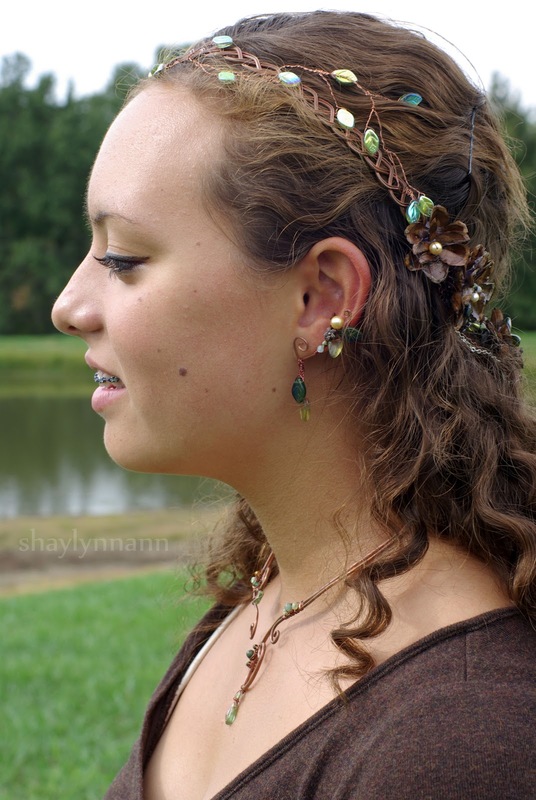 This is a decorated ear cuff with two removable and interchangeable dangles! Last but not least, a cool ear wrap (and a small ear cuff). 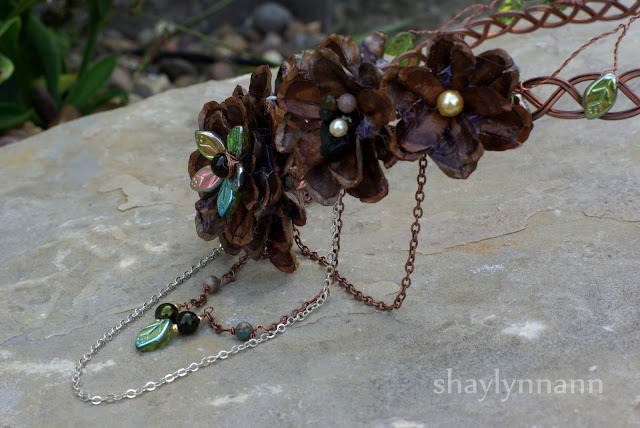 This is not an original idea-- as much as I wish it were!-- and was inspired in part by Thyme2Dream and SunnySkiesStudio. 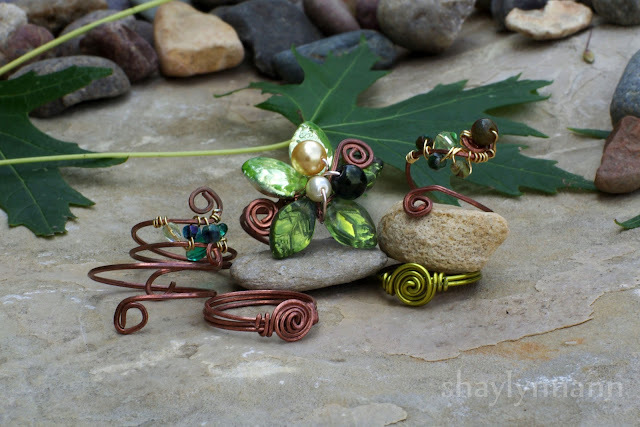 Making this set was a wonderful experience and it has really pushed my wirewrapping skills! I can't wait to work on more jewelry like this. :) Which is your favorite piece? 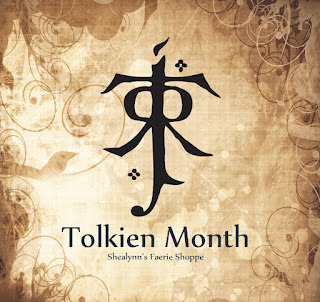 Tolkien Month Will Be Tolkien... Couple of Months? Thirdly and finally, I wish to make an ANNOUNCEMENT! I regret to announce that- though, as I said, eleventy-one years is far too short a time to spend among you- this is the END! I am going. I am leaving NOW! GOODBYE!" Nope, not going anywhere, not stopping blogging, etc, etc, etc. 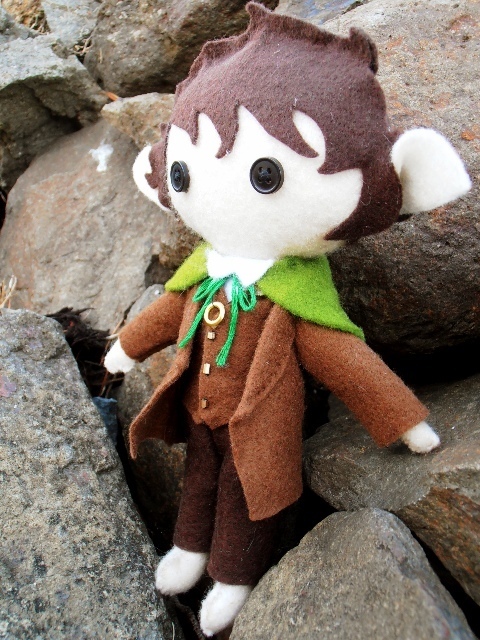 I just love Bilbo's birthday speech! 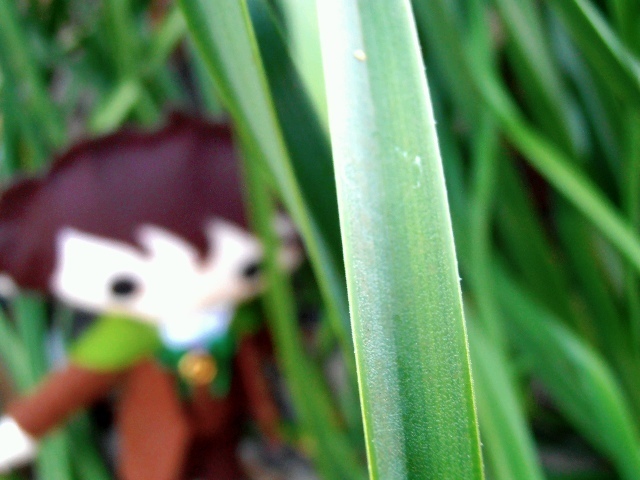 I hope that you all have enjoyed celebrating Bilbo and Frodo's birthday month! We've celebrated Lord of the Rings poetry, artwork, interviews with artists, a giveaway, cool crafts, Hobbit genealogy Pinterest, and more! 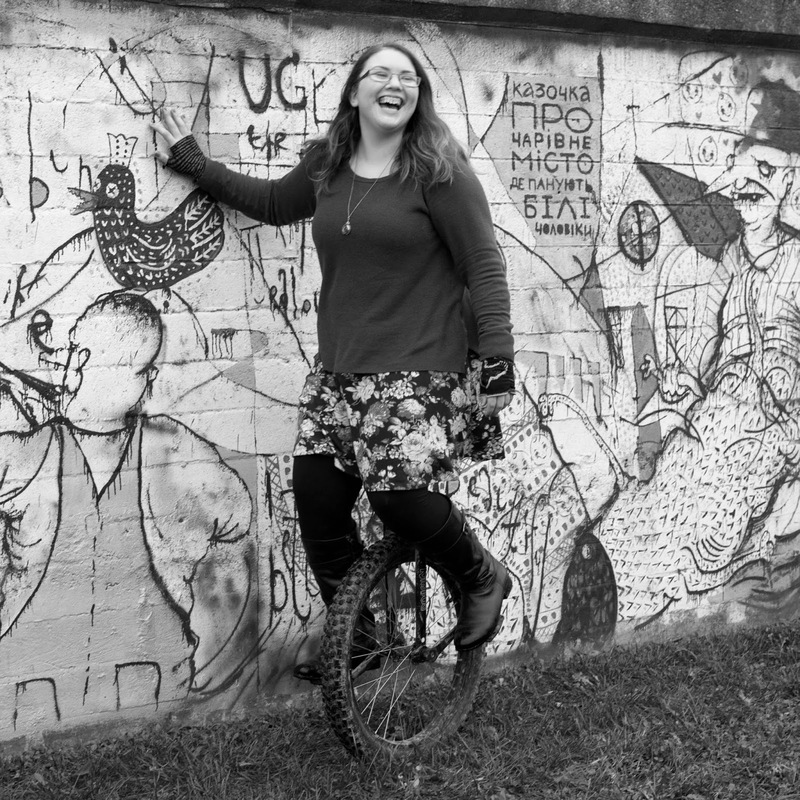 So many amazing bloggers (and even readers without blogs!) 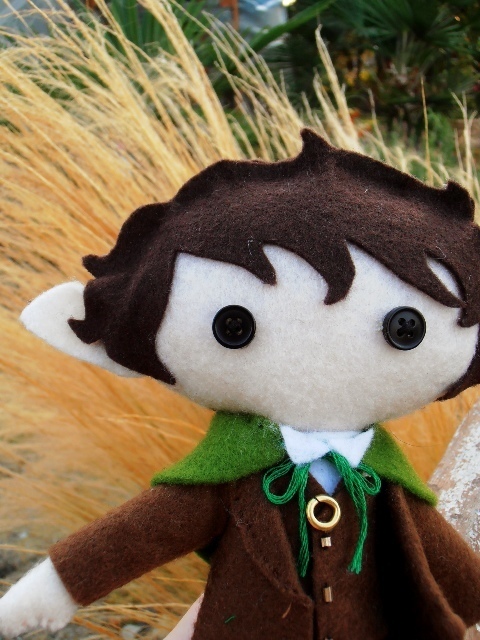 have done guest posts and left wonderful notes about just how much they love Tolkien's stories! But I've just barely scraped the surface. I seriously underestimated my free time. This is an oft-recurring problem, isn't it, my dear friends? Next time that I promise a big event here on the blog, I need you to take me aside and tell me in no uncertain terms that "No matter how hard you try, Shaylynn, you are a busy girl and much to busy to do every little project that pops into your head. Also, you are not a wizard and can therefore be late. Very late, getting things done." 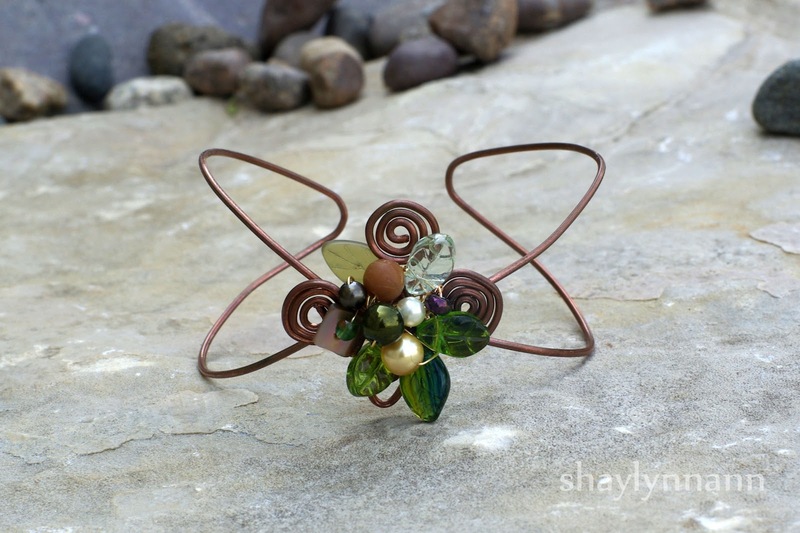 I do so want to do every little project that pops into my head, and I get many ideas. Just the other day I was writing an essay on political stuff in the 1600's (my history work is just so fascinating right now) when this glorious shade of green popped into my mind, followed by a round door, and flowers, and soon enough an entire drawing of Hobbiton fought to keep my attention away from the essay! This, of course, made me remember that I was going to try to do an art contest that is due in one week, which I haven't even begun, and then I started to think about how I could get my brother to pose with my art teacher's dagger, and that reminded me... Long story short, that essay took a long time. 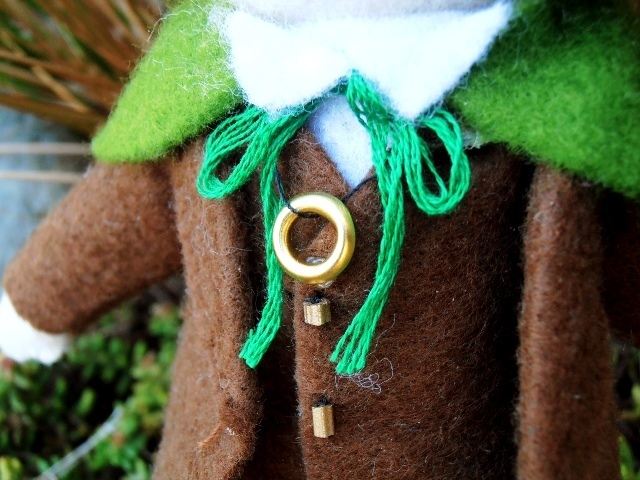 There are so many things that I want to blog about Tolkien, simply because he's awesome and so inspiring. I wanted to do a post on his artwork (did you know that he was an artist? ), the sets and costumes of the movie, some seriously amazing cosplay I've seen online, two different crafts, and Elvish primer, and tons of drawings. I started a Lord of the Rings sketchbook but of course am only fifteen pages into it with at least fifty ideas tingling at the tips of my fingers. Fingers which I have to force to write stoichimetric equations for at least four hours three days a week. The curse with being a homeschooler is that when you attend a class, even a college class, it's so boring. Even if the content is completely new and you actually have to work to understand it, it takes so much time. I haven't even shared any pictures of The Long Expected Party! I know you guys are awaiting that anxiously, but most of my photos did not turn out and I want to ask some friends if I can publish theirs, and then I have to figure out who is comfortable having their photos on my blog. Me dancing with Mom and Dad during one of the dances where you constantly switch partners. No idea who had my camera at this point but I'm glad they got this shot when they did! Ignore how funny-looking that red thing is in the picture above; to the left, you can see how the balloon decorations actually looked! 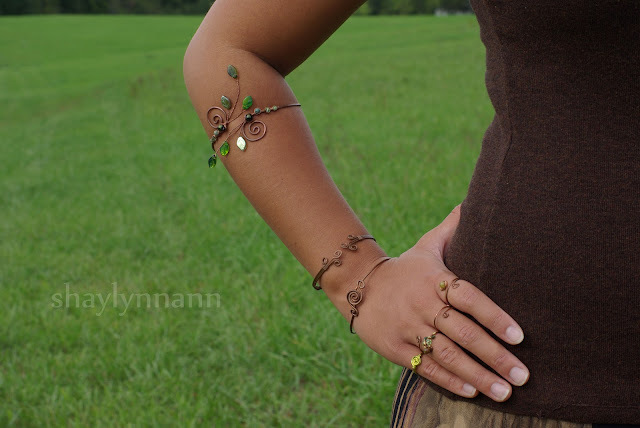 And, in just a few hours, you can see the FINISHED ENTWIFE COSTUME, complete with the jewelry set I designed! When I read Shaylynn's first post about Tolkien Month, I thought, "I have got to do something for that. Because... because that is awesome." But since that post was back in July, I figured that I had time to think of something really special to do. And then came August.... And September.... And then school started... and I just could not seem to find time to draw! But I felt like I had to because Tolkien was so brilliant. The first week of September, aka, Tolkien Month rolled by. I thought, "I have really got to draw!" And then the second week: Same thing. And finally last Saturday I managed it. 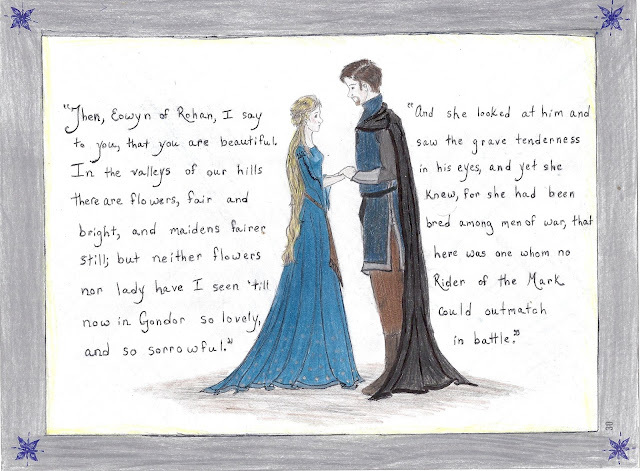 I went and got a few amazing quotes about Faramir and Eowyn and found myself quite inspired. Isn't it amazing what words can do? My scanner decided to wash out the colors a bit. Evil scanner. 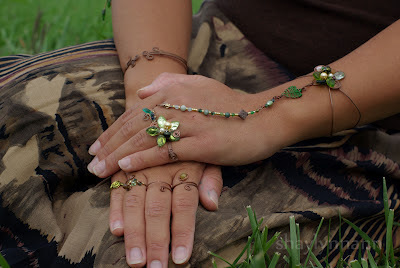 My name is Rebekah Hendrian, and I am one of the owners/designers of VirvatuliDesigns, from West Michigan, USA. I am a 23 year old writer who works in a bookstore and runs an Etsy shop on the side. I am working on publishing my first novel, an Arthurian retelling for ages 10 and up, which means I am writing queries and getting rejection letters. I love to read, and when I have the time, my favorite things to read, after anything written by Tolkien, would be historical fantasy, dystopian/cyberpunk or steampunk novels, and nonfiction. I also like pre-90's Marvel comics, and I dabble in art. VirvatuliDesigns is the storefront for Rebekah and Grace Hendrian's excess creativity. Virvatuli is Finnish for "will o'the wisp." While neither Rebekah nor Grace is Finnish (that they know), will o'the wisps, fairy lights, ghost candles, etc., are a folklore motif, and are here today, gone tomorrow. It was quite fitting for fantasy inspired crafts that, because of the way they're made, can never be replicated exactly. And it was fun to write in calligraphy. 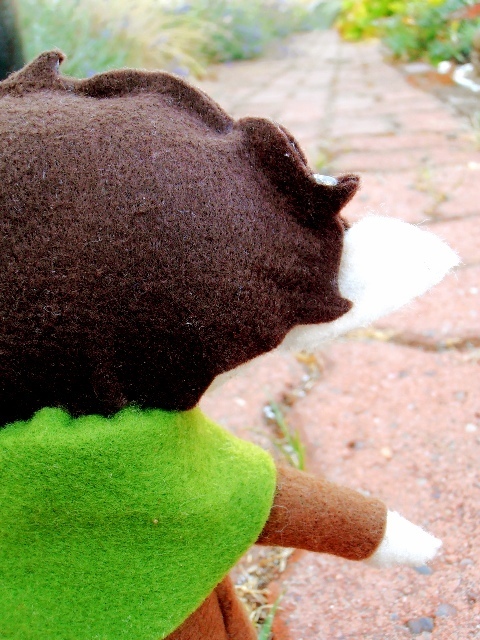 Grace makes dolls that are inspired by fairy tales, legends, pop culture, and her favorite novels, sometimes all at once. 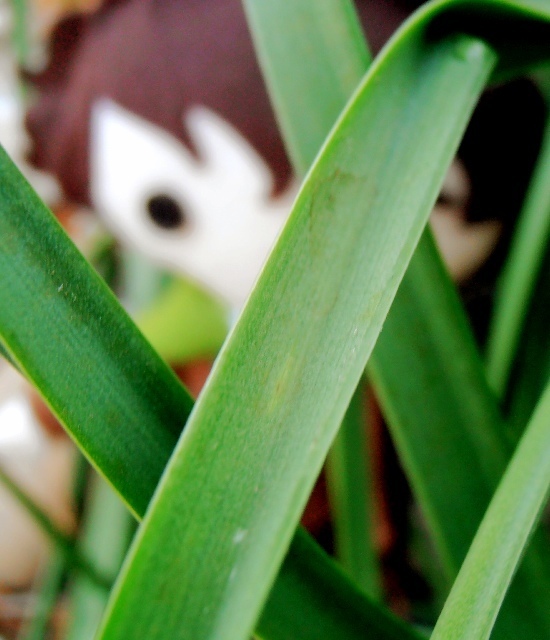 She hopes to add some male characters to her doll collection, so be on the look out for those in the future. Rebekah does most of the knitting, and likes to knit gloves more than anything else. 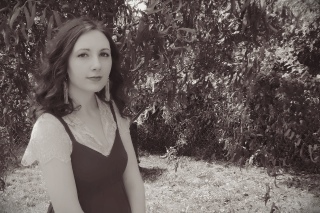 Her designs are inspired by books first, the natural world and folklore next, and she is planning on adding some larger knit pieces, such as cardigans, in the future. activities to soothe the discomforts brought on by PRTS, and bring you back to reality with a gentle push, not a shove. If you can't find any of these albums or artists, just put on a Howard Shore or Celtic Internet radio station. If you just read The Hobbit, and are looking for light adventure fare with deep themes, read The Chronicles of Narnia or The Princess and the Goblin, or Susan Fletcher's Dragon Chronicles. 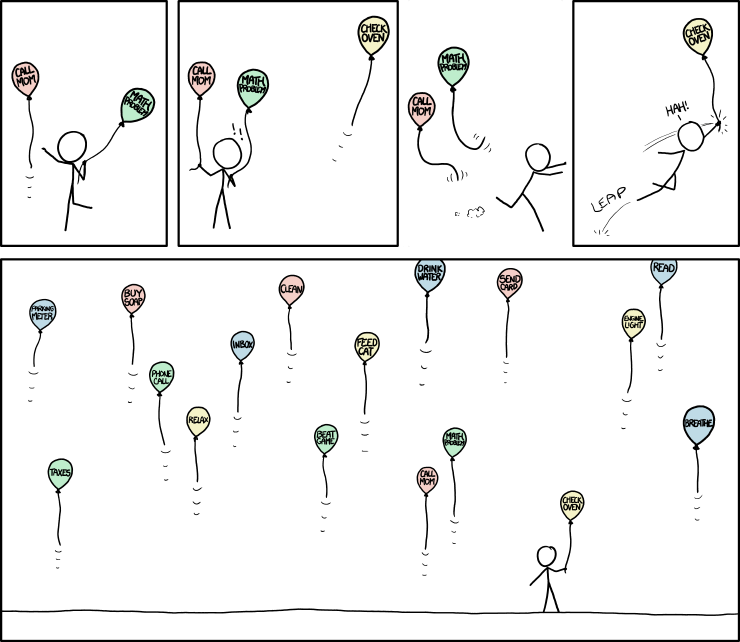 You also might try Christopher Paolini's Eragon. If you are a young Tolkien fan and wish there were more books with fantastical places and creatures, try the Fablehaven series or Beyonders: A World Without Heroes, both by Brandon Mull, or the Redwall series. If you read The Lord of the Rings Trilogy, and need another series with a returning king and unlikely heroes, read Lloyd Alexander's Chronicles of Prydain or The Monster Blood Tattoo Trilogy by D. M. Cornish (not nearly as silly as it sounds-with a very Tolkien feel!). in the humans than elves, try the Ranger's Apprentice Series by John Flanagan. If you read the Silmarillion, The Lost Tales, or Unfinished Tales, and need more dreamy locales, bittersweet endings, epic romances, legendary heroes, and/or magic, try The Forgotten Beasts of Eld, by Patricia A. McKillip, The Hero and the Crown or Chalice, Robin McKinley, the Abhorsen Trilogy by Garth Nix, Til We Have Faces, by C. S. Lewis, Le Morte D'Arthur, or The Perilous Gard by Elizabeth Marie Pope. If you read The Legend of Sigurd and Gudrun, try Beowulf, retro (pre 90's) Thor comics (I'm serious), Rosemary Sutcliff's Historical Fiction, Ursula Le Guin's Earthsea Series, The Song of Roland, Susan Cooper's TheDark is Rising series, Stephen R. Lawhead's The Dragon King Trilogy, Sir Gawain and the Green Knight (translated by Tolkien!) or good old collections of Norse Mythology. If you read Smith of Wootton Major or Farmer Giles of Ham, try Grimm's Fairy Tales, Patricia Wrede's Enchanted Forest Chronicles, T. H. White's The Sword in the Stone, or Cornelia Funke's Inheart. If you read Roverandom, try Andrew Peterson's Wingfeather Saga, Neil Gaiman's Odd and the Frost Giants, or N. D. Wilson's 100 Cupboards Trilogy. If you read any or all of the above, or if you need to laugh, hard, I would also recommend The Dark Lord of Derkholm by Diana Wynne Jones and Gerald Morris's The Squire's Tales (Arthurian mischief and humor). or a TV show like Once Upon a Time. Look at Alan Lee's and J. W. Waterhouse's art books, or visual guides to England, Ireland, Scotland, or Wales. 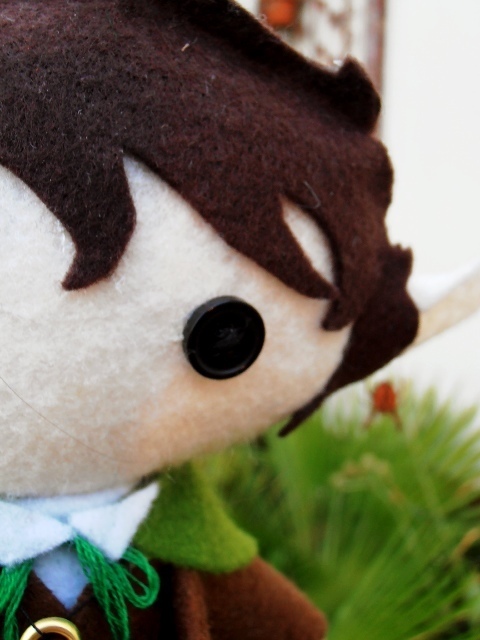 Write a story about Elves, Dwarves, or anything else you wish was (or wasn't) real. Phone a similarly suffering friend and commiserate, then do any of the above activities together. From one sufferer of PRTS to another, I hope these suggestions help you on your road to recovery. Pioneer in the study of PRTS and its effects. (only a month late...but, as Shaylynn told me, "A wizard is never late! "), I finally finished it. inexpensive to make, which is one of the reasons I love them so much! I hope you all enjoyed this post! 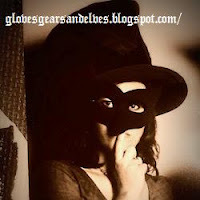 Feel free to hop over to my blog to say "Hi"!